People visiting Vietnam consider Mekong Delta as the must in the itinerary, located in the southern part of Vietnam, Mekong delta covers a vast area including 11 provinces along Mekong river. 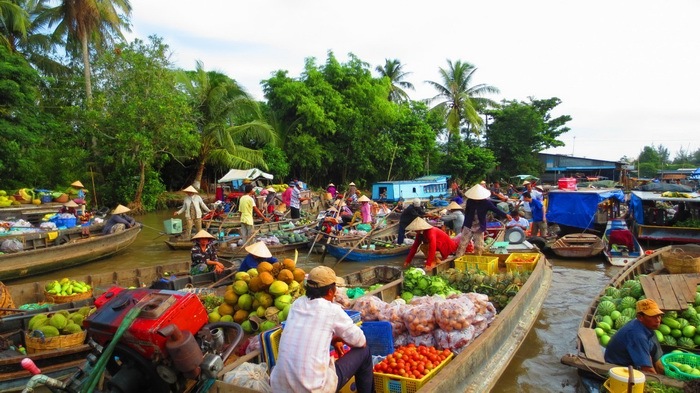 All tours to Mekong Delta include a visit to the floating markets, foreign travellers are taken on wooden boat, running through the interlaced canals and join local traders. The best place to have your homestay in the Mekong Delta is Vinh Long and Can Tho, you can take a public bus from Sai Gon to Vinh Long in 2 hours, fares 4 usd or to Can Tho in 6 hours, fares 9 usd. The homestays are located in the village along the canals. Facilites are quite simple, bedding is clean, squat toilets outside the rooms and food is fantastic, the hosts at homestay are extremely friendly, willing to join tourists with their drinks, jokes and local sweet songs. If you have time enough consider taking 1 or 2 days to Tra Vinh and Soc Trang, Tra Vinh is famous for pagodas and temples built by Chinese, there used to be a Chinese community in Tra Vinh and Chinese culture are left in the cultural works like pagodas, monasteries. And Soc Trang is largely inhabited by Khmer people, originated from Cambodia, Khmer people still preserve their culture through festivals and worships, Soc Trang is also known for Bat Pagoda with hundreds of thousands of bats inhabited in the pagoda, a fire a few years ago burnt most of the pagoda and it was rebuilt. Kien Giang is 250 km from Ho Chi Minh city, the town of Rach Gia is the base for people travelling to Phu Quoc island by hydrofoil. Phu Quoc is famous for its natural beauty, white sand beaches and peaceful countryside, you can travel by road from Sai Gon to Rach Gia, fares 10-12 usd, from here catch a hydrofoil to Phu Quoc in 2 hours, fares 10 usd. Chau Doc town belongs to An Giang province, this border town is the gateway to Cambodia, travellers can cross the border to Cambodia by boat or road, from Chau Doc you can catch a speed boat all the way down to Phnom Penh in 6 hours, fares 15 usd, the boat trip is long however you are rewarded with spectacular sceneries. If you travel by road from Ho Chi Minh city, it takes 7 hours drive, public bus fares 10 usd, it is recommended to have 1 or 2 days in Chau Doc before leaving for Cambodia, the town itself is peaceful and beautiful, it is a mixture of Vietnamese and Cambodian culture, just hire a motorbike and discover the town yourself, a favourite site is the floating housed on the canals where poeple live and raise fish in the cages under floor. Chau Doc is also famous for Sam mountain with Ba Chua Xu pagoda festival and the ox racing at the beginning of lunar year.